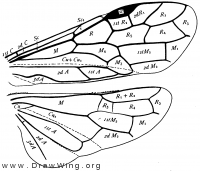 Wings of Xyelidae from Goulet and Huber (1993, fig. 321) . Antena of Xyela redrawn from Gauld and Bolton (1988, fig. 41). (1988) The Hymenoptera. Oxford University Press, Oxford. Wings of Macroxyela. From Comstock (fig. 424) .